Home » Our First Day Out In Bangkok! Our very first day out in Bangkok, Thailand! So we arrived in Bangkok late at night. 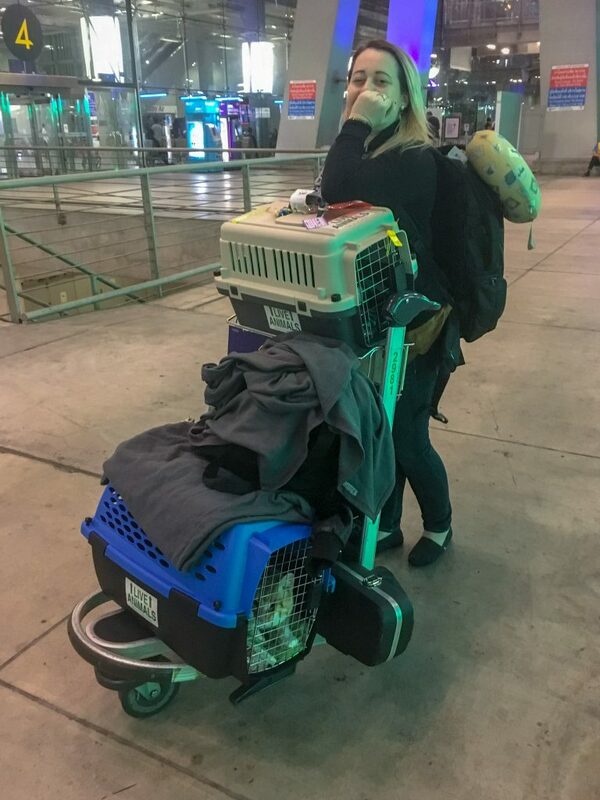 We landed, went through immigration, and after a heart attack of not being able to find out where they kept our pets, we grabbed them. Landing in a new country was extremely overwhelming but felt so rewarding at the same time. I doubt we were as stressed as these two cats! But today was a new day! We woke up exhilarated and ready to tackle the day! Linus… not so much. So we woke up, took a look around outside, and began exploring the streets. Bangkok has beautiful gems everywhere in the midst of even the smallest of alleyways. Here the locals leave their daily offerings. We took a cab to the BTS station in On Nut where we grabbed a train ride to the mall. We needed cell phone plans and our friend who has been living here for 3 1/2 years recommended us going to dtac to handle this. When we got off the train and saw the mall we were blown away! This mall had three separate buildings. Each one between 6-8 floors that all connected. The crazy part is that this isn’t even the biggest mall in Bangkok! In all of our years of traveling around the US, we have never seen malls like we do here. After VAT and the tip, our total bill was 808 baht! That’s only $23.08 USD! After lunch, we walked all around the mall. We were eyeing up every place that we would want to eat at in the future. The architecture is incredible. We were told that we had to go to the MBK Center to unlock our iPhones. We do not have photos from the MBK center but that was also massive! It was in Siam which my first impression of Siam is that it is the Times Square of Bangkok. Where we went to get our phones unlocked was insanely busy and overwhelming. Stands everywhere with people shouting trying to make sales. They took our phones for an hour and a half and could not unlock them in the end. We roamed the entire MBK Center which had more things for sale and to do than I would even know how to name. Though we left upset that we had no data plan (which meant no map), we had a great time during our first day in Bangkok! Check out the photo gallery below.